My first English cocker spaniel was named Kensey, bred by two-time English Cocker Spaniel Championship winner Carl Colclough from the Parkbreck line of gundogs. Carl’s father, Clarence, was the gamekeeper on my family’s estate in England, and Carl had agreed to sell Kensey to my parents as a favor to his father. Kensey, a handsome 15-month-old black-and-white dog, was about the best present a young boy could wish for. He arrived at my house well on his way to being fully trained and just in time for my 13th birthday. Kensey proved to be a wonderful companion—full of hunting ability and tolerance for my many mistakes. In many ways he was as significant an influence on my early hunting years as my grandmother—a dedicated countrywoman and fanatical wingshot. Kensey guided me through the extraordinary highs and inevitable lows of a bird hunting childhood. He stayed with me through high school, after which I moved to South Africa for a year abroad. Faced with the prospect of being out of the country for 12 months followed by four years at college, I thought it best to find Kensey a new owner who would hunt him regularly. Thankfully I was successful, and I left him with his new family before departing. Following college, I was able to take on another puppy—this time an English cocker bred by Calla Harrison and again originating from Carl Colclough’s Parkbreck line. Since then I have been lucky enough to own and train a number of bird dogs, all of them English cocker spaniels. Looking back, my strong relationship with Kensey certainly influenced my views on flushing and retrieving dogs. Kensey was a stylish hunter with a tight quartering pattern. I would cast him in one direction with a hand signal, and he would turn on command to work the ground on the other side, never straying more than 15 yards in either direction. Honestly, I don’t believe there is a better hunting friend in the dog world than a cocker spaniel. I don’t contend that cockers are the most versatile flushing and retrieving dogs. Nor do I suggest that cockers are the most durable hunters. On average a Labrador will outperform a cocker in water, and a springer will outlast a cocker in cold weather. However, a cocker’s personality is unmatched. No dog will do more to please its owner in the field or nuzzle closer on the couch. Cockers’ willingness to sacrifice themselves for their masters in pursuit of birds is unique. For these reasons and many more, English cockers are continuing to win admirers in North America. Certainly the English cocker spaniel we recognize today has changed markedly from the varied collection of dogs seen in the UK up until the early 1970s. Untypical cockers present before this time were largely the result of outbreeding, which was banned by the Kennel Club around 1969. 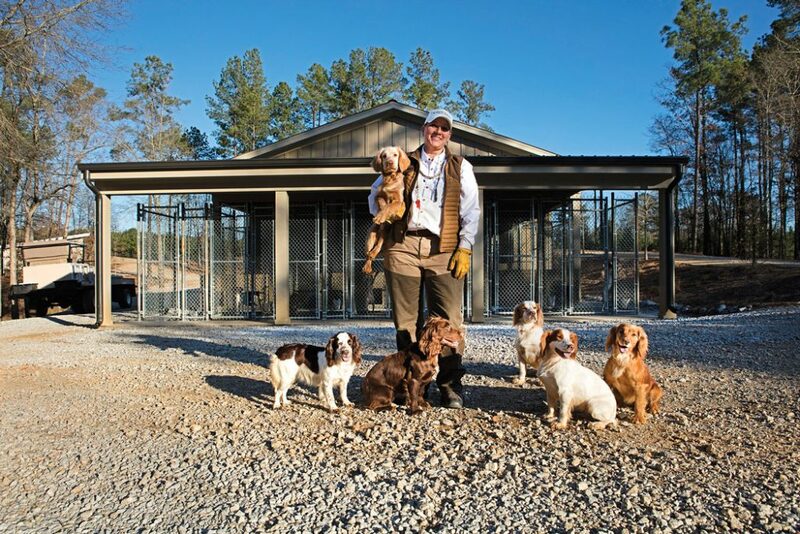 Latterly, my interest in cocker spaniels along with my desire to build a strong line of working cockers in the US led me to Fishing Creek Farms, near Union Point, Georgia. Here I had the pleasure of hunting quail with owner Rob Taylor and guide Tyla Kuhn of Sunsage Sporting Dogs. I had met Tyla and her husband, Scott, years earlier while waterfowl hunting in Louisiana, and we had become friends through our shared interest in cocker spaniels. In fact, my purpose in traveling to Fishing Creek Farm was to watch Tyla and Scott work their line of English cockers, particularly a young red female named Willow that I had imported from the UK. Cockers live to not only flush game but also retrieve—and snuggle on the couch at the end of the day. Scott and Tyla both grew up in Oregon and were some of the first wingshooting guides in the state to run English cockers. Their first dog, Otis, was a red-and-white male bred by Jay Parrish of Blue Chip Kennels, in Iowa. What first attracted Scott to cockers and led him to Otis was their size and versatility. Otis proved a big hit, not only from a handling perspective but also with Scott’s clients. Those who hunted over Otis quickly fell in love with him, even if they didn’t always recognize what breed he was. Working cockers out West proved a different challenge to using the dogs on a Southern quail plantation, as Scott and Tyla soon learned. When working a cocker as a single flushing dog out West, the handler directs the dog to quarter away and, ideally, work into the wind. Although this scenario provides the best scenting conditions, it is not always practical. In this case the dog marks off of the handler’s position, so as the handler moves forward through the cover, the dog is always working new ground. 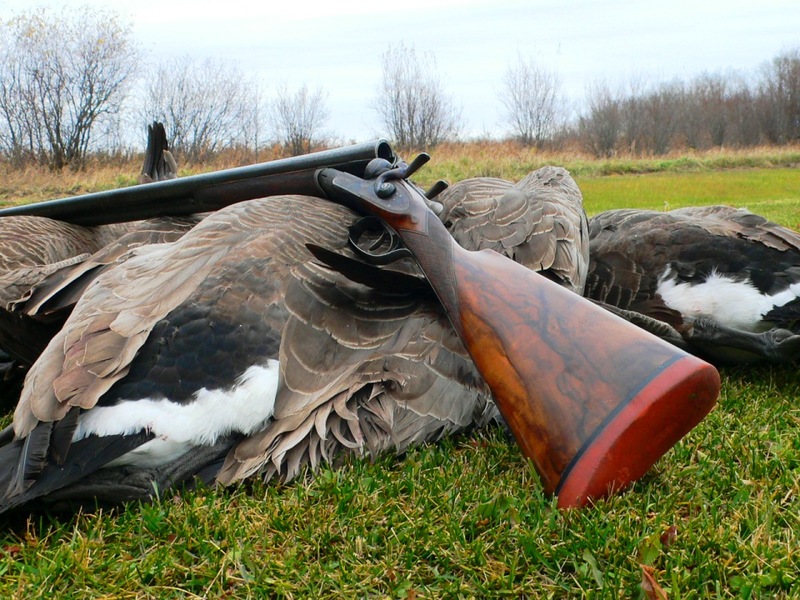 This close-quartering pattern is typical of cockers and other flushing breeds and should result in birds flushing within gun range. This is as opposed to pointing dogs, which may be encouraged to hunt at great distances in order to locate and hold game. The takeaway is that range is critical but different for flushing and pointing breeds. 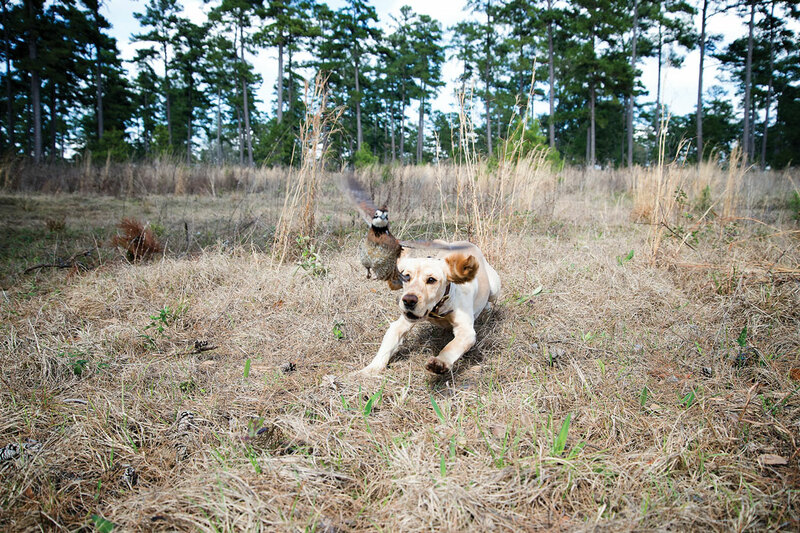 By contrast, when working a cocker in tandem with pointing dogs—which has become increasingly popular on Southern quail plantations—the cocker usually walks at heel while the pointers locate game. 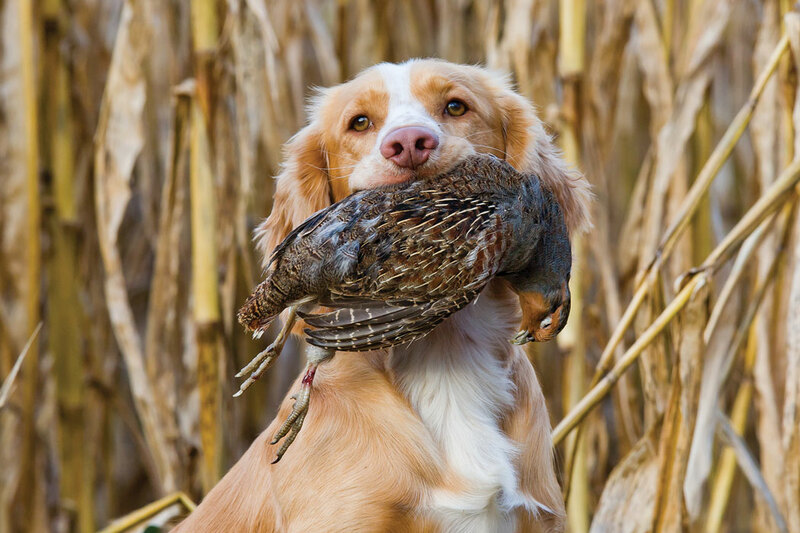 Once game is made and the hunters have reached the point, the cocker is sent to flush the bird(s) and retrieve fallen game. Like pointing dogs, cockers can be trained to hold steady to wing & shot, or to “Hup” on the flush as it is sometimes referred to. While this skill adds a safety feature and is appealing to the hunter’s eye, it is not always practical for covey birds. 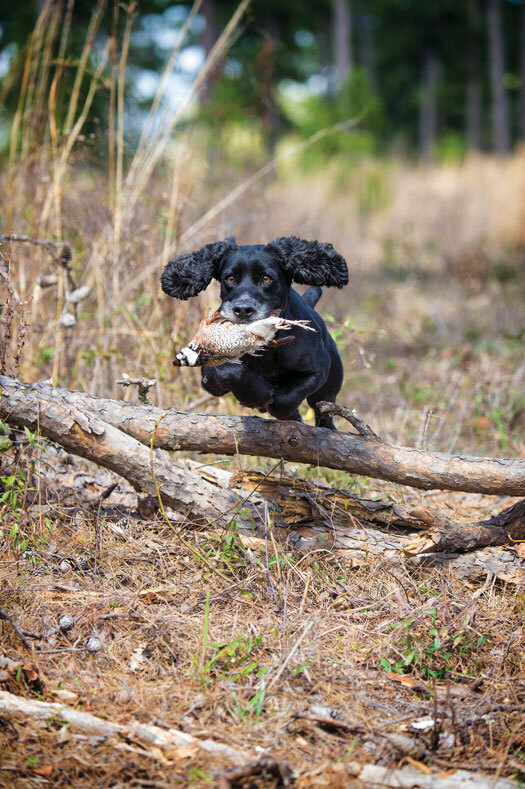 With a pair of hunters shooting a covey rise, many handlers believe it is preferable for the retrieving dog to locate downed birds fast, lest they lose a cripple. 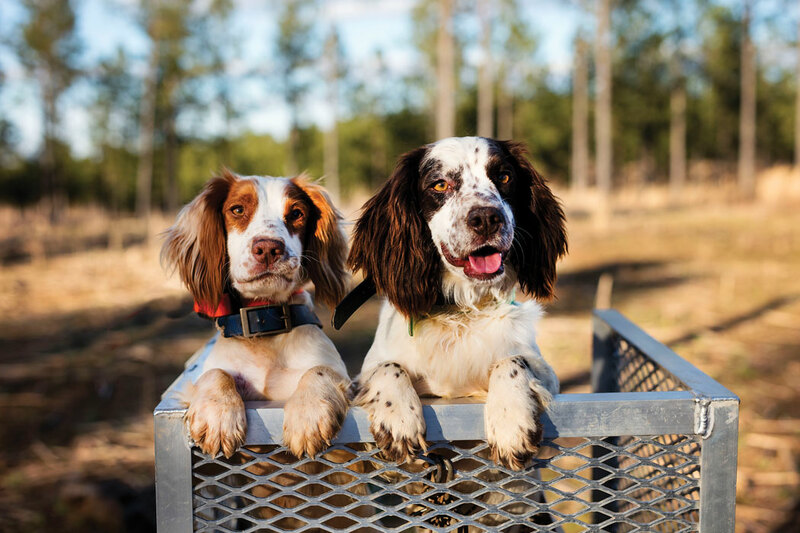 In fact, it is this combination of English cockers and traditional pointing breeds that has made one of the greatest differences to contemporary quail hunters. Simply put: Cockers are carving a niche for themselves as the perfect foil to pointing dogs on plantation quail. Introducing cockers has gone a long way toward replicating the experience of wild-covey flushes. Fishing Creek Farms guide Tyla Kuhn with a bevy of cockers from the Sunsage Sporting Dogs line. While hunting at Fishing Creek, I had the opportunity to watch my Willow work quail for the first time—and her performance was electric. She was elegant in her movement, covering ground fast and with a low action. Tyla kept Willow at heel until the pointers made game, and then sent her to flush while the pointers held steady. Although the pointers were trained to retrieve, it was evident that Willow held the upper hand in this department. When Willow took a well-earned break, I used the opportunity to run my other cocker, Austin—a solid-red male that I had bred in the UK and brought to the US as a pup in 2012. Although Austin’s performance didn’t quite match Willow’s, the young dog lacked nothing in enthusiasm and his determination to find, flush and retrieve quail. It was easy to see that he had the potential to become a first-rate quail dog. 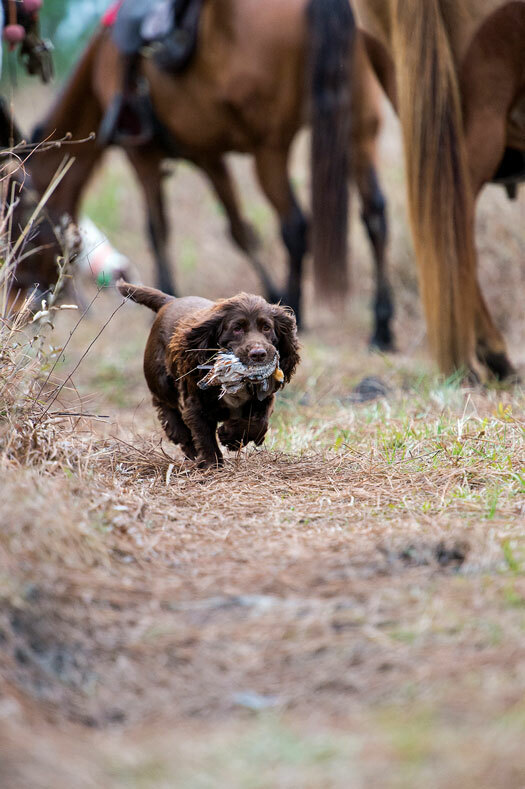 My experiences at Fishing Creek and elsewhere across the US have shown why English cocker spaniels have won a place in the hearts of American hunters and guaranteed themselves a bright future in the field and at home. Indeed, these compact and lovable companions have a personality that makes them a delight to share a point with. 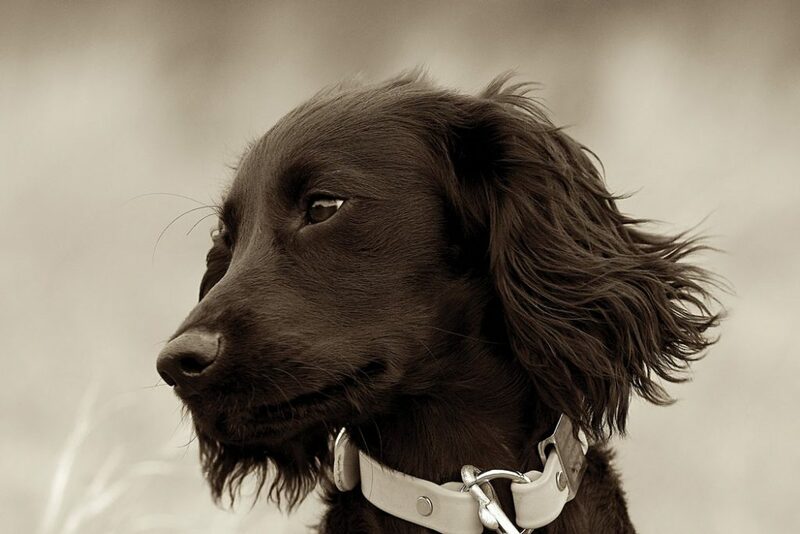 Since 1893 the UK Kennel Club has recognized distinct spaniel groups, of which the cocker spaniel is one. 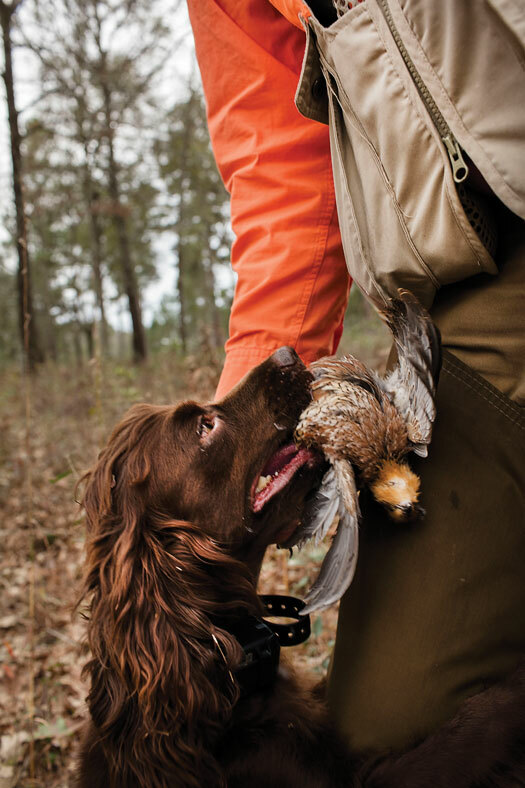 The name “cocker” originated with hunters who preferred these small-type spaniels for hunting tight coverts for woodcock—a practice known as “cocking.” Today cocker spaniels are worked on a variety of North American upland species. Certainly these smart little dogs have become firm favorites with both pheasant and quail hunters. The English cocker is a compact, muscular and biddable dog. Males typically measure 15 to 17 inches to their shoulders, with females measuring 14 to 16 inches. 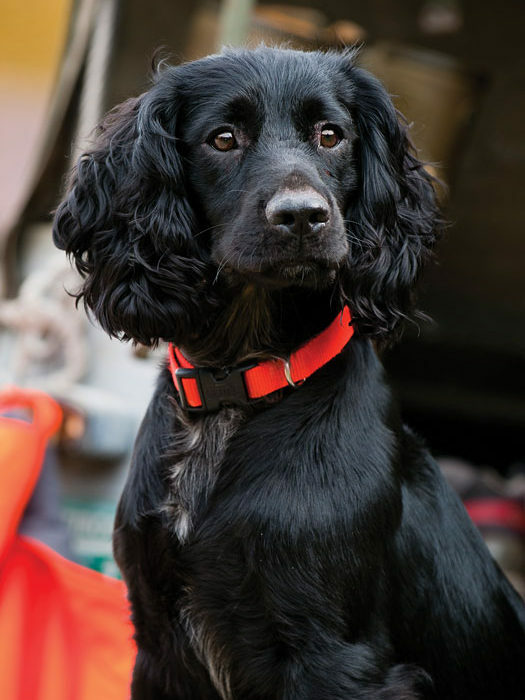 In order to avoid damage while hunting, working cockers have their tails docked to one-third length in their first week of life. Male cockers usually weigh between 24 and 30 pounds, with females between 22 and 28 pounds. Cockers’ coats are medium in length and can be straight or wavy. It is also common to see feathering on the chest and legs. English cockers exhibit a variety of coat colors, with no breed standard. The three key color genes are black, chocolate and red, with red being the only recessive gene. These three colors deliver a veritable rainbow of combinations, including solid black, chocolate (also known as liver), red (sometimes called golden or lemon), parti-colors (red & white, black & white, and chocolate & white) and roans (an even mixture of white and pigmented hairs). Tri-color cockers occur where the recessive red color shows through. In such cases red is often referred to as tan, and the dog is considered a black, tan & white or chocolate, tan & white. 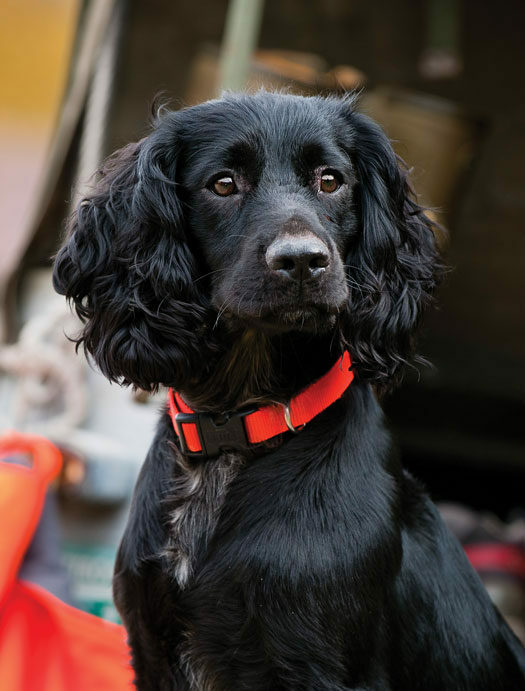 In contrast to the show variety of these dogs, it’s important to remember that working cockers should be bred for their ability first and foremost. .info, and for details on field trials and hunt tests in the US, go to fieldcockers.com.